We are here and we are grateful for this opportunity to support you and your ongoing expansion. We invite you to take a big breath and acknowledge yourself as you release what you have been holding. Depending on your personal perception and beliefs, these are either challenging or exciting times. From the perspective of a multidimensional being these are awesome and transformational times. Knowing, accepting and truly understanding that you are here to anchor a new reality can and does shift how you view what is occurring. We do not want to invalidate your personal experience of any hardship or challenging reality. We are inviting you to stretch beyond that challenge or hardship, beyond limitation of any kind. We are here to remind you of who you truly are, beings of conscious thought and creators of your experience. We are here to trigger your remembering, to invite you to move beyond the veil of denial, beyond limited beliefs of any kind. We hope this transmission offers you the opportunity to stretch into a new expanded awareness and consideration of what might be possible. Just play with this idea, allow it to unfold within. Do your best not to need instant proof of what we are suggesting. Allow yourself to just imagine the possibilities. We will speak of the quantum field once again for that is the key to your ascension and transformation. We understand that this possibility is still a bit far out considering the logical programming of most humans. If there is no proof or you cannot see it or feel it, it seemingly cannot be real. We have often shared that the quantum field is pure energy and it reacts to your vibrational input. We are inviting you to begin to call forth the quality of quantum consciousness, to look at reality from this expanded viewpoint of infinite possibilities. This vantage point will unlock your imagination and offer you access to your true magnificence and expansion. We will speak of quantum entanglement and offer an invitation to explore and consider its potentiality and potency. We would like you to play with these ‘out of the box’ ideas. Since you are vibrations in your purest form dwelling in a physical body, your focus is usually in the physical reality, which is important in order for you to strive and survive. Now we would like you to focus on yourself as a pure vibrational being of light that offers an energy signature to others. Every living thing on your planet offers an energy signature. What if once you had interfaced with another being a quantum entanglement occurred, a link up, a connection, was quickly formed in the quantum field. This link up or entanglement is in the field of pure energy. Stay with us here because we are going to stretch your limited beliefs. Quantum entanglement refers to how particles of light can come together, bond and share quantum bits of light information. In the quantum realms, the important aspect of this exchange and bonding is that once these light particles have become entangled, they continue to share information no matter how far apart they become in space and perhaps even time. Now with this possibility in mind, we would like you to consider, just for a moment, every single interaction you have ever had with anyone. Whether it was passing someone on the street, in the store, at a social gathering, sharing the space in an airplane, or a classroom, in a job or a family matrix, there was and is an entanglement in this field of pure quantum light particles. Think of the millions and millions of connections and bonded entanglements that are a part of your quantum consciousness, your personal quantum entanglement. Now stretch this concept a bit further and consider that each bonded entanglement you have made throughout your entire life also connects you to the quantum entanglement of each of those individuals, and those quantum connections continue. Can you begin to sense, feel and understand that you are truly connected to ALL? We can almost feel your panic at the very thought of being connected to those who might not hold the highest vibrations or integrity, those who generate hatred, prejudice, anger and rage. The truth is you have always been connected to ALL. You have perhaps denied, refused to consider these connections, pushed against the possibility that those limited qualities or traits could ever be yours. Now is the time to expand into your true magnificence and own these connections, understanding that by doing so you can and do offer uplifting energy of transformation to these entangled links. If this is true, then when you heal some aspect of yourself, when you have an insight, a spontaneous understanding or clarity, this information ripples throughout your personal quantum entanglements. 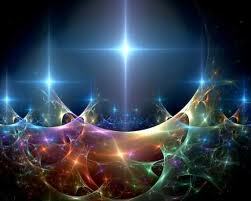 Just as you are bonded by the light particles of others in this quantum field, when they are uplifted so are you. This is an important understanding because now you can begin to see just how your very thoughts, feelings, words and vibrations truly influence the whole. Your every action ripples out to this quantum network. When you bless rather than judge, when you forgive rather than condemn, when you express gratitude and appreciation, you are offering life sustaining vibrations, energy data and encouragement along your quantum down line. So in this quantum world, all possibilities and potentials exist simultaneously until one potential is observed or called forth. In the entangled community when more and more vibrational beings are offering high conscious frequencies of love, joy, gratitude and understanding, that is the potential reality that will manifest for all. You can help call forth a reality that honors others and all living beings, a reality that supports and encourages the well-being of all, a reality that owns, honors and acknowledges the divineness within one another. You are powerful beyond measure. When you accept this level of consciousness, you begin to truly transform the misqualified energies and vibrations of others in a loving manner. The nature of entangled or connected light particles is how wondrous information is shared instantaneously across time and space. When you radiate the vibrations of love and joy, it is a blessing of grace. We are grateful that you have accepted our invitation, just play with the quantum concepts, be easy with yourself and others and know it is all unfolding and expansion is occurring. Remember that your multidimensional self understands this quantum reality. We are always available to serve you.